Well, as intended, I’m sticking to a pretty strict budget till the end of the month. With only $14 left as of a week ago, I knew the rest of the month would be produce-only shopping…and would rely heavily on beans. My grocery shopping this week was very strategic: filling, nutritious, and on sale. I knew I already had a good size bag of carrots in my fridge, so veggies to round out a nice soup, like celery and onions and potatoes, seemed likely candidates. 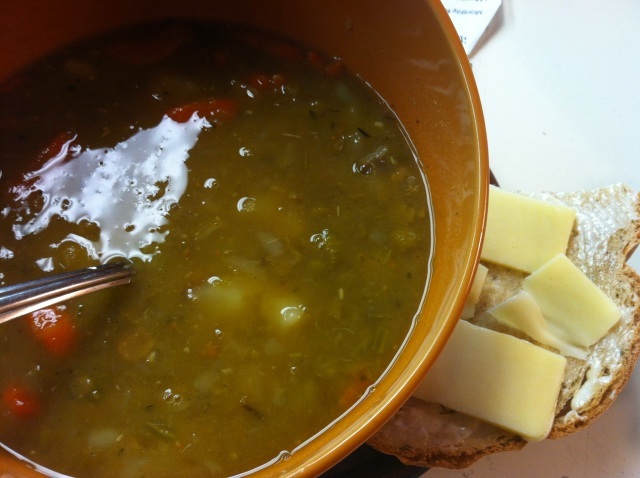 It really doesn’t get much easier than split pea soup. Start by chopping a whole onion, and sauteeing it in a healthy amount of butter with a few stalks of chopped celery and carrots. Add 1.5 cups of dried split peas, add water, and bring to a boil. I discovered during my annual pantry inventory that I have some powdered veggie bullion that needs to get used up, so rather than go with my regular Better Than Bullion chicken base, I decided to make this soup entirely veggie, and used the powdered stuff instead, supplementing with some necessary spices like fresh ground coriander, salt, boquet garni, and even a little garam masala at the end. I let this boil down for over an hour, adding water as it reduced, waiting for those cute little peas to split open and puree themselves. Towards the end, I diced a few red potatoes and threw them in to bulk it up some more. With a loaf of homemade bread to accompany (this week: orange rye caraway), a hearty soup like this one can easily be my lunch for a week; I heat it up at work with a few slices of bread that I toast that morning, a light spread of mayo and some cheese and maybe some lettuce or a collard leaf if I’m lucky enough to remember to pack it in the morning, and this’ll keep me going until the last customer leaves beaming with their cone of yarn at 6:00.